Keith started training with our kickboxing club in March 2013. He decided in March 2015 he wanted to bulk up and joined one of our personal training programs. Over the past 4 years he has gone from strength to strength. Showing determination and commitment to both the club and his personal training program. Keith is a prime example of what can be achieved when you commit to training and take your instructor's advice. His two main aims were to achieve his 1st dan black belt, which is scheduled for June 2017, and to improve muscle mass, in particular become leaner and defined. Keith has shown improvements in his technical kickboxing ability through improved flexibility, balance, coordination and form. His regular personal training sessions have complimented his kickboxing ability by improving strength and fitness which lead him to a more defined physique and a competitive fighter within the club. Alongside the above Keith has changed his diet to accommodate what was his new lifestyle back in 2015. Keith soon realised to achieve the gains he wanted he would need to amend his diet. 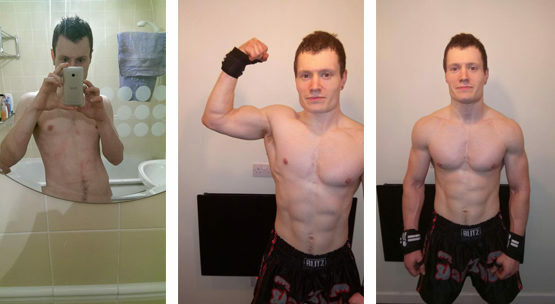 The change was applied and he found his new eating habit now gave him the energy he needs to perform the work outs, maintain his body weight and help his body repair and build the muscle he aspired to achieve. We are excited by Keiths results to date and look forward to see what the future has in store. At Elemental Fitness, we are confident Keith will continue to smash his targets and excel in kickboxing. Keep up the hard work Keith, you deserve all the gains you get from our training!